What: This family run Trattoria and Pizzeria is a bustling, family friendly spot offering a huge variety of delicious Italian dishes and homemade pasta by their executive pasta chef Nino Galastro. The personalized service from Antimo, his siblings, and the wonderful staff make this a go-to spot. The monthly specials usually hail from Campania, a region in Southern Italy. Seasonal al fresco dining. See the Full Menu here and Catering Menu here. BYOB. Faves: Eggplant Rollatini, Shrimp Caesar Salad, Spaghetti Bolognese, Trenton Tomato Pie, Meatballs, Chicken Soup. What: Shortly after Rory and Aaron Phillipson opened their doors in March 2006 they were reviewed by the New York Times, and the rest is history. Serving up "seasonal, creative and delicious menus in their little blue house in Hopewell" is what they do best. They have "crafted a new American menu with entrees you wish would never end". Chef Phillipson attended the Culinary Institute of America and his past experiences include an apprenticeship at Manhattan's famed La Cote Basque among others. Reservations highly recommended. See the Seasonal Menu here, and Group and Private Events here. BYOB. Where: 101 East Broad Street - Reservations call 609.333.1710 or visit www.thebluebottlecafe.com. Faves: Blue Bottle Salad, Gnocchi, and pretty much everything served on their ever changing seasonal menu! What: "The food you want from the farmer you know". Their tag line says it all, and Jon and Robin McConaughy's newest addition to Hopewell is the sublime Brick Farm Market. Created to be a "full service market located within a stone's throw of the source: Double Brook Farm", the Market features products grown or raised at their sustainable farm. The Market includes a butcher, cheese maker, produce and bakery. See the seasonal menu here, which includes a Country Benedict or Monte Cristo for breakfast, Pressed Paninis, Rotisserie Chicken, Farm Burger, Short Ribs and much more. And coming soon, their new restaurant: BRICK MARKET TAVERN. Can't wait to see what more this amazing couple has in store! Be sure to check it out. What: Since 2000, this cozy spot has offered a seasonally changing menu along with daily specials thanks to chef and co-owner Will Mooney, a Culinary Institute of America graduate with past experience that includes The Hotel Pierre and The Frog and The Peach. With a full service restaurant to the right, the left side of the building is lined with take-out cases filled with fresh salads, cheese, specialty meats, breads, pastries and more from their own ovens. Chef Will is also a private chef and teaches cooking classes at the restaurant. Seasonal al fresco dining. See seasonal menus here. BYOB. What: This Hopewell hub serves up coffee and treats daily. The warm and friendly atmosphere of this much-loved neighborhood spot is a joy, and the delicious, homemade breakfast and lunch options are a must. Cozy chairs and lots of tables inside and out make this a great spot to meet a friend or gather for a casual meeting. And with their book collection, stocked game and toy shelf, and kids train table on the side porch, they've got all the bases covered! Mon-Tues: 6:30am-6pm / Wed-Sat: 6:30am-9pm / Sun 8am-6pm. Faves: Ice Coffee, Homemade scones, Banana Smoothie, Veggie Wrap, Fresh OJ. DA'S KITCHEN & CATERING *rated best Thai in NJ by Zagat! What: The arrival of authentic Thai food in Hopewell is thanks to a great partnership. Chef Da Detoro began her training as a child taught by her great-grandmother, and went on to study at the Royal Thai Culinary School and le Cordon Blue. This led to a small restaurant annex in Princeton which developed a devoted following. Once discovered by Clark Reed (a Hopewell resident who fell in love with the food in Thailand during a six month stay), he asked what he could do to bring her to Hopewell. In 2011 they opened Da's Kitchen. Outfitted with a new "dream kitchen", Chef Da's followers come for her "painstakingly authentic cuisine that she says has become increasingly difficult to find elsewhere, including her homeland, where the old ways are disappearing." The menu is a "fusion of Thai cuisines" and is available for eat in or take-out. See lunch and dinner menu here. What: Pizza, wings, hoagies and more served from this "local institution" by Franco himself, who has been here for over thirty years. Much loved by a devoted following. What: The Inn is Hopewell's only spot for happy hour, at either the horseshoe bar or outside tables overlooking Broad Street. The adjacent Bistro serves "Euro-American cuisine and casual country dining" including authentic Hungarian dishes and European style desserts. See the brunch menu here, lunch menu here, and dinner menu here. Free Wi-Fi. What: The dizzyingly divine brainchild of Tom Grim (the founder of Princeton's Thomas Sweet Ice Cream), Nomad Pizza is a little slice of heaven in Hopewell. "Years of Grim's experimenting have brought you 300 grams of impeccable dough, its yeast, salt, and flour precisely weighed. Left to rest for four days, its ready to be deftly rolled into shape, adorned with the freshest toppings, and personally watched over in the oven. It takes just two minutes to make what is arguably the best pizza in New Jersey." Seasonal al fresco dining. See full menu here. No reservations. Cash only. BYOB. Where: 10 East Broad Street (609.466-6623) OR at your home or event with Nomad's impeccably restored REO Speedwagon pizza truck. 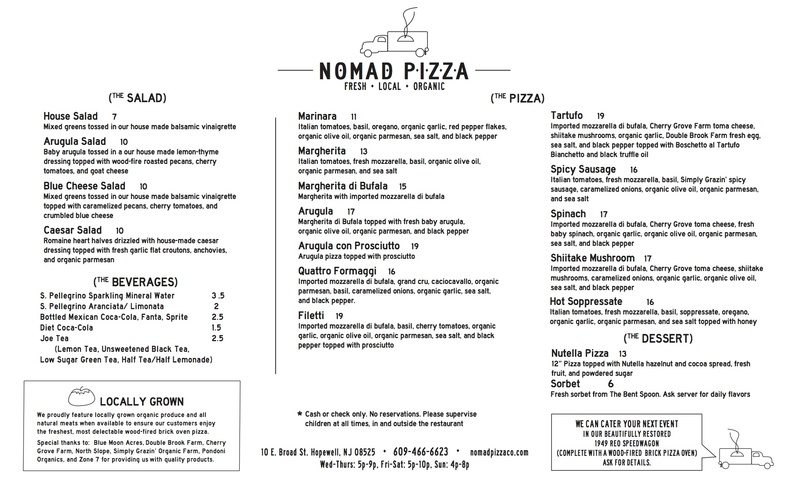 For info contact bookings@NomadPizzaCo.com. What: Tucked in a corner spot with casual seating inside and out, Peasant Grill serves up "quality handmade food in small batches, using fresh ingredients you can pronounce." A great spot for scrumptious sandwiches, salads, fresh-baked treats, and good news... now dinner! Look for "time-honored family recipes with a current twist" as well as their own signature dishes. Take-Out service allows for home cooked meals to go. Seasonal al fresco dining. See full menu here. BYOB.